› Author Affiliations Funding This work was supported by Deutsche Forschungsgemeinschaft (DFG) grant SFB1123-A03 to J.B. and A.K., SFB1123-B03 to Y.A., by DFG within the framework of Munich Cluster for Systems Neurology (EXC 1010 SyNergy) and of LMUexc (LMU-Singapore strategic partnership) to J.B.
Chemokines orchestrate leukocyte recruitment in atherosclerosis and their blockade is a promising anti-atherosclerotic strategy, but few chemokine-based approaches have advanced into clinical trials, in part owing to the complexity and redundancy of the chemokine network. Macrophage migration inhibitory factor (MIF) is a pivotal mediator of atherosclerotic lesion formation. 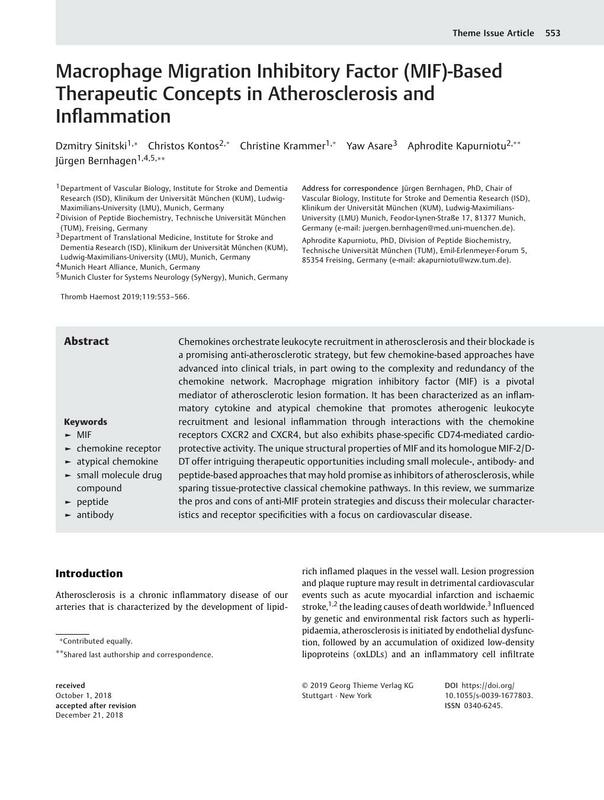 It has been characterized as an inflammatory cytokine and atypical chemokine that promotes atherogenic leukocyte recruitment and lesional inflammation through interactions with the chemokine receptors CXCR2 and CXCR4, but also exhibits phase-specific CD74-mediated cardioprotective activity. The unique structural properties of MIF and its homologue MIF-2/D-DT offer intriguing therapeutic opportunities including small molecule-, antibody- and peptide-based approaches that may hold promise as inhibitors of atherosclerosis, while sparing tissue-protective classical chemokine pathways. In this review, we summarize the pros and cons of anti-MIF protein strategies and discuss their molecular characteristics and receptor specificities with a focus on cardiovascular disease. ** Shared last authorship and correspondence.